So, we have an all star on our roster at Camp Harborview. Many are familiar with him as he carries a name similar to a famous NBA legend, Magic Johnson, but he is much more than a former NBA athlete. Magic embarked on an adventure this week. 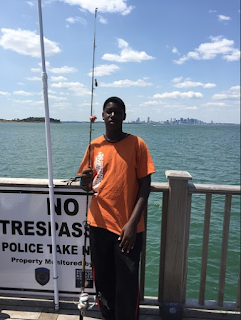 He is fairly new to the fishing club and has an affinity for the work we carry out for CHV. His first request was to teach him how to set up a rod. He knew the basics but wanted to familiarise himself with how to do it. 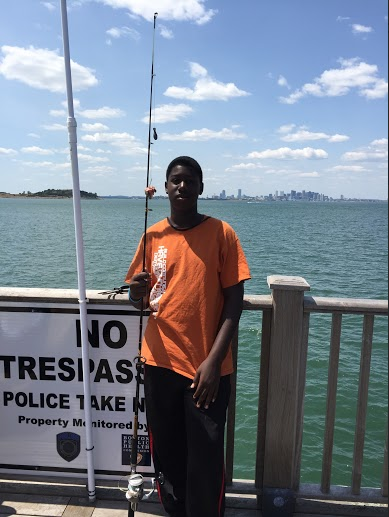 He has long term goals of acquiring his own fishing rod and wanted our expert help. Its amazing to see the effect we have on our club members in such an immediate way. Contrary to former sites I have worked at this site has really allowed me to extend leadership and life advice to our members. We share an intimate connection that allows us all to enjoy our days. After teaching magic the novice, intermediate, and somewhat advanced lining skills we attempted to recreate each. He succeeded! His face lit up with joy and he also is now teaching his fellow partners how to set up rods. This has so far been the highlight of the beginning portion of my summer.